Certainly, many young people are going online, communicating via text and social media such as Facebook, Instagram, Twitter, Whats App and others. And in that environment, they are open to bullying by friends, and even worse dangers from strangers. No doubt educating students about the dangers of the digital world and how to protect themselves must be good. 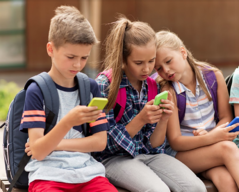 There is another approach which could also help – building students’ social skills and teaching them how to combat bullying if they encounter it, whether online or in the real world. This approach could make them stronger, more confident and less prone to become victims. Fortunately, there are programs schools can use to grow students who are socially strong and successful.